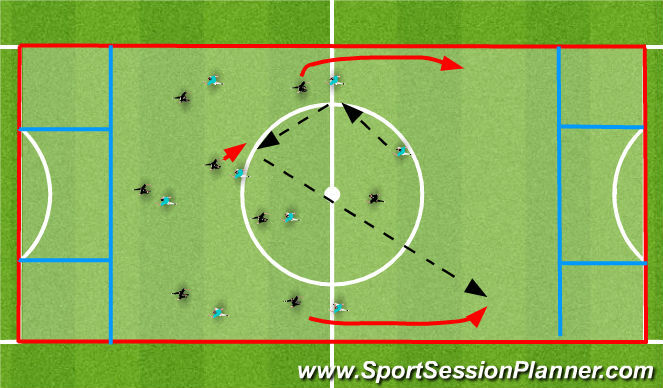 Central player passes into Neutral player who sets the ball back. Central player then plays ball to the wide player who passes to the opp. central player. Same pattern on way back opposite direction. Teams set up in a 3-3-1 formation. Teams score by dribling or receiving the ball in the endzone (wide zones are 1 point, central zone is 3 points. One team focuses on building play up while other looks to counter quickly. - Reading team-mates body position to create options (e.g if striker has back to goal, player needs to provide option for drop.